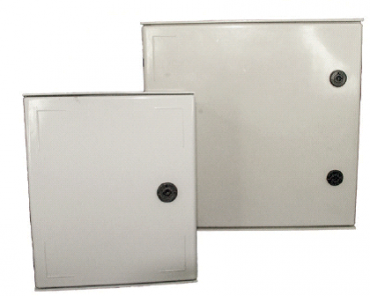 TIP Series GRP Enclosures For Electrical Housing Applications. – Self-extinguishing, high impact and resistant glass reinforced polyester colour RAL9002. – Corrosion and chemical resistant. – Corrosion resistant Zamak hinges. – Temperature Range: -30 to 120 degrees Celsius. – Enclosures supplied complete with mounting plate and mounting hardware. 16STIP325 300H x 250W x 140D mm, mounting plate 263 x 201mm, 2.30kg. 16TIP43 400H x 300W x 200D mm, mounting plate 353 x 245mm, 3.85kg. 16TIP44 400H x 400W x 200D mm, mounting plate 349 x 345mm, 4.90kg. 16TIP54 500H x 400W x 200D mm, mounting plate 453 x 345mm, 5.70kg. 16TIP64 600H x 400W x 230D mm, mounting plate 553 x 345mm, 7.95kg. 16TIP65 600H x 500W x 230D mm, mounting plate 553 x 447mm, 8.90kg. 16TIP86 800H x 600W x 300D mm, mounting plate 749 x 540mm, 14.00kg.